Paramount Pictures released a short, one-minute teaser for the latest Denis Villeneuve (Prisoners, Sicario) film last week and honestly that probably would have been enough for a long time, but by the end of that exceptional tease we were already promised a full trailer less than a week down the line and here we are-with a full minute and a half more footage to better wrap our heads around what exactly Villeneuve will be exploring this time. Each of the directors last three films have been in my top fifteen of the year and so it is something of an understatement to say I'm excited to see what he does next though the fact the films screenplay was penned by the guy who wrote Final Destination 5 and The Thing re-make is a bit concerning. That said, he also penned Lights Out which has been getting great reviews (I still need to see that one) and so maybe it is all in the execution which is something Villeneuve excels at-just look at Prisoners especially. With Arrival, the director has paired with Amy Adams for the story of an expert linguist who is recruited by the military to determine whether the aliens on a craft that has landed have come in peace or are a threat. The trailer looks insanely tense and well photographed, but unfortunately it feels as if it gives away more than I was hoping it would. The aspect of focusing on language and the breaking down of how we communicate with an invading species though is insanely interesting and seems to have given way to a number of interesting facets that have been explored throughout the film all of which garner strong repercussions on the life of our protagonist. 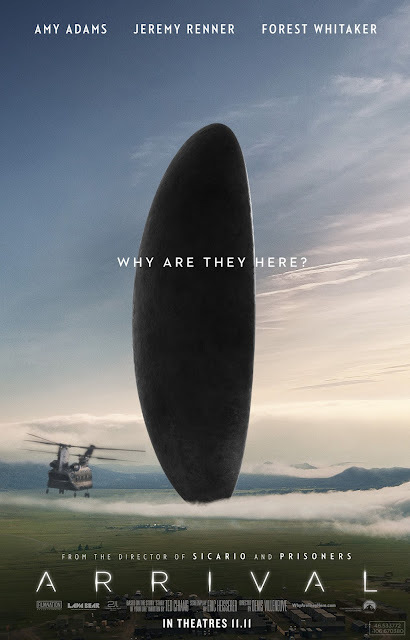 Arrival will play at this year’s Toronto International Film Festival and Venice Film Festival before opening on November 11th and features a supporting cast that includes the likes of Jeremy Renner, Forest Whitaker, and Michael Stuhlbarg.